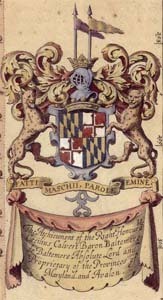 Charles Calvert grew up with the knowledge that he would some day become the Third Lord Baltimore and Proprietary Governor of Maryland. As the son of Cecil Calvert and Anne Arundell, Charles lived the privileged life of an English noble. Charles was also raised Roman Catholic, just as the rest of the Calvert family was. As a young man, Charles witnessed the religious conflicts between Protestants and Catholics in the English Civil Wars. He watched his father, Cecil, handle very difficult political situations in order to protect his control of the Maryland Province. Cecil Calvert sent his 24-year-old son Charles to Maryland in 1661. Charles replaced his uncle Philip Calvert as Governor. Philip then became Charles' advisor in government affairs. Charles remained colonial Governor until his father's death in 1675. The colony's population and economy expanded quickly in Charles' term. Charles created four new counties on the Eastern Shore. During his term as Governor, Charles ordered many public projects to help Marylanders. He built court houses, jails, roads and highways. He improved the defense of the colony by building magazines where gunpowder could be stored. Under his administration, Maryland's government passed laws regulating how people could leave land to their heirs when they died. Charles also reformed the lower house in the Maryland Assembly, now called the House of Delegates. He decided to restrict voting to men who owned properties worth 40 pounds. He also ruled that only men who owned 1,000 acres of land could be elected as a delegate. He changed the voting requirements, because he was concerned that less wealthy delegates might oppose the Proprietary government. Slaves's lives were made more difficult under Charles's government. During his term, the Assembly officially made slavery legal, and ordered that slaves serve their masters for life. In 1675, Cecil Calvert died in England. Charles inherited his father's lands, title and government roles. He became the Third Baron of Baltimore and new Lord Proprietor of Maryland. He was the first member of the Calvert family to serve both as Maryland's Governor and Lord Proprietor. Charles went to England shortly after his father died, but returned to live in Maryland and oversee the colony personally. During his years as Proprietor, there was a boundary dispute between Maryland and William Penn's Quaker colony in Pennsylvania. Charles left Maryland and sailed back to England in 1684 to settle this dispute with William Penn. Before the boundary line could be verified, another revolution happened in England. Two Protestants, King William and Queen Mary accepted joint rule of England. Since Charles was Catholic, the new King and Queen took away his right to govern Maryland. Now Maryland was ruled directly by the English Monarchy and overseen by a Royal Governor. Charles died in 1715 before he could recover power over his colony. In that same year, King George I granted Charles' grandson full proprietary rights to govern Maryland.